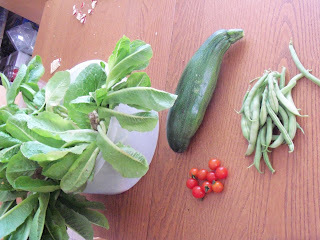 The garden continues to grow, though it is not producing as well as I had hoped. I think this has just been such a cold summer some of the plants aren't producing according to my schedule - Darn nature! 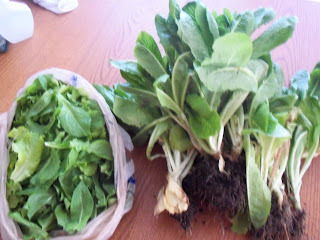 One of the bigger garden tasks in the last few weeks was pulling out the rest of the romaine lettuce. 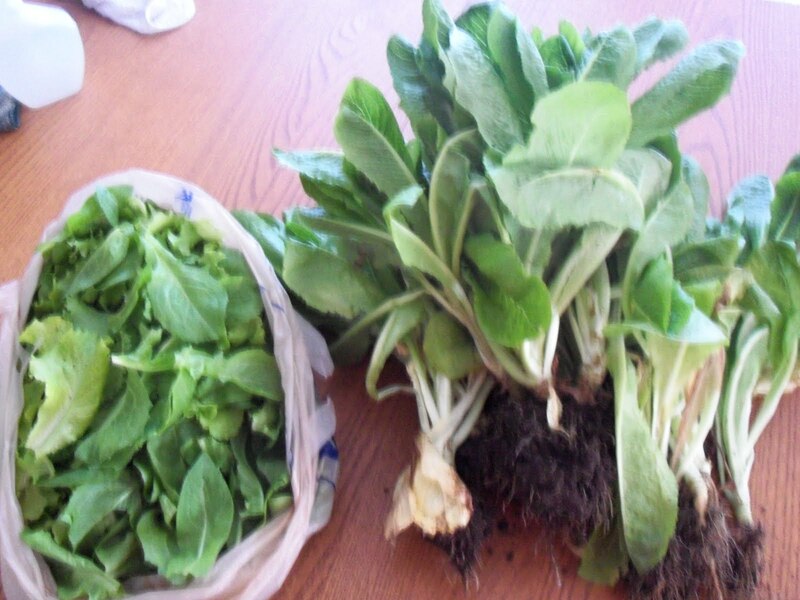 I had been letting it grow into big heads, but we couldn't eat it fast enough and some of the heads were starting to get too tall and the outer leaves wilting so I pulled it all out in two big batches, washed it, and shared it with friends. 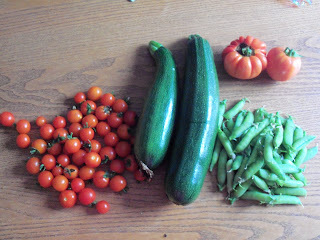 Here's a photo of the very last of it about a week ago along with the first few cherry tomatoes, some green beans & a zucchini. The hardest part of reaping this much lettuce at once was getting it all cleaned. I have to pull the whole head so I have all this dirt to cut off and then I toss it all in the sink to soak in cold water. The cold water really refreshes the leaves and plumps things up. When I was washing this first batch I came across a slug - so super gross- that was small and I figured had drowned. Nope, I tossed it aside and a few minutes later it was crawling up the side of the sink - so super gross again. As I washed the lettuce I found two more slugs - again teeny, but gross - and DH and I fought over who had to get rid of them. It is seriously disgusting to have slugs in your kitchen sink. I'm sure you can imagine. This is what I picked today. Finally we are getting a couple larger tomatoes along with lots of cherry tomatoes & snap peas. The girls helped me pick peas & tomatoes three days ago, so all these are only 3 days' worth of ripened veggies - Yum! Also, check out that tomato that looks like a pumpkin! Oh my goodness, I can so relate to the super gross slugs! We used to get slugs that came into our kitchen in our condo at night. Imagine waking up in the morning and heading into the kitchen to make coffee and finding a great big fat slug on your counter. Super gross!! So glad we sold that place for that and many other reasons! Yeah, I have to admit your slug situation is so much grosser than mine! At least I know where mine came from and when I brought them in. Eew!